The first edition of The Internal Auditing Handbook received wide acclaim from readers and became established as one of the definitive publications on internal auditing. The second edition was released soon after to reflect the rapid progress of the internal audit profession. 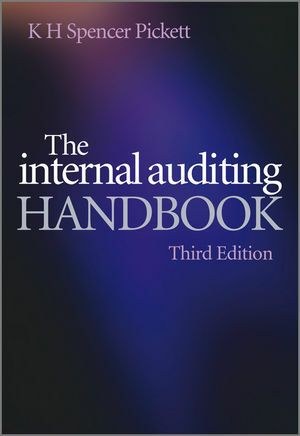 There have been a number of significant changes in the practice of internal auditing since publication of the second edition and this revised third edition reflects those changes. The third edition of The Internal Auditing Handbook retains all the detailed material that formed the basis of the second edition and has been updated to reflect the Institute of Internal Auditor’s (IIA) International Standards for the Professional Practice of Internal Auditing. Each chapter has a section on new developments to reflect changes that have occurred over the last few years. The key role of auditors in reviewing corporate governance and risk management is discussed in conjunction with the elevation of the status of the chief audit executive and heightened expectations from boards and audit committees. Another new feature is a series of multi-choice questions that have been developed and included at the end of each chapter. This edition of The Internal Auditing Handbook will prove to be an indispensable reference for both new and experienced auditors, as well as business managers, members of audit committees, control and compliance teams, and all those who may have an interest in promoting corporate governance. K H Spencer Pickett MSc FCCA MIIA FIIA CFE ASSOC.CIPD (London, UK) is a course director specialising in internal audit, risk management and fraud awareness training. Spencer has authored 12 books published by John Wiley and Sons (Inc and UK). He is a member of ACCA Corporate Governance and Risk Management Committee, a member of ACCA Internal Audit Members Network, and is an executive committee member of the UK’s Control Risk Self Assessment Forum.